Despite the belief that people “eat with their eyes” first, taste is the boss of all senses when it comes to food. But in the case of okonomiyaki, it doesn’t matter much. This savory Japanese pancake is dressed to kill and will make your tastebuds dance in a fit of frenzy; this savory Japanese pancake is life. When I first started doing my homework for this series, okonomiyaki was the first dish that jumped out at me. With all of it’s golden crisp goodness and striking trimmings, how could it not? I’m a sucker for anything that is crunchy, savory and bursting with umami, and without ever having tried this gem before I could already tell how it would taste; flippin’ delicious. So, undeterred by my lack of familiarity with it, okonomiyaki was the first thing I penned on my list for the Japanese segment of this series. After all, this series is about becoming familiar with East + Southeast Asian food beyond the Americanized menu and encouraging others (yeah, you!) to tap deeper into these culture’s cuisines. 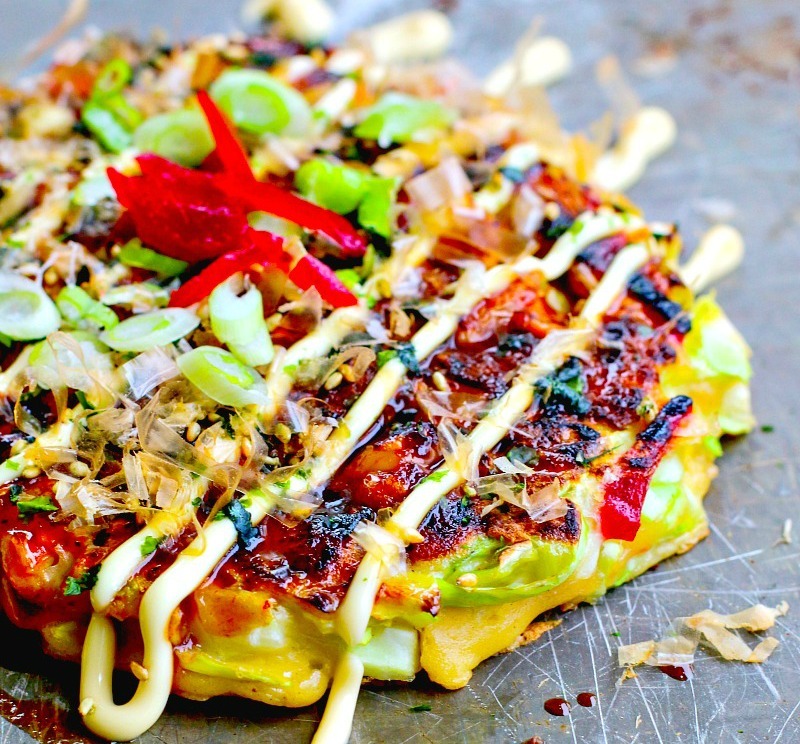 The name okonomiyaki translates to “grilled how you like”. Some restaurants that specialize in okonomiyaki boast a diner-style counter where the chef prepares the dish in front of the patrons; other restaurants pride themselves in being a grill-it-yourself establishment where the server gives patrons the chance to be their own chef with a bowl of uncooked ingredients + hotplates on their tables — similar to Korean BBQ or Shabu-Shabu restaurants. There are several versions of this dish, including modan-yaki (served with a layer of fried noodles) and negiyaki (a thinner pancake that incorporates a lot more scallions), but okonomiyaki is the most predominant throughout the majority of Japan. Most of the ingredients are common and include eggs, flour, cabbage and dashi, but there are a few shining ingredients that might be new to you. The nagaimo, Japanese mayo and pickled red ginger. None of these are essential ingredients, but they’re highly recommended for best results. Your tastebuds will thank you. The naigaimo is a Chinese yam. Despite it being an optional ingredient, it adds a fluffiness to your pancake that you *don’t* want to miss out on. Most large Asian markets carry it, but if you can’t find it, you can still cook up a stellar okonomiyaki. In fact, I came across several okonomiyaki recipes throughout my research that didn’t include it. Japanese mayo is similar to regular ol’ American mayo, except not. (Whut.) Kewpie, which is Japan’s Hellman’s, has a smoother texture and a tangier flavor than it’s American kin. This is due to the fact that Kewpie increases the egg count, decreases the egg whites, uses vegetable oil, swaps the usual white vinegar for rice vinegar, and adds MSG. Yes, that last ingredient is often disputed, but if you want the true flavor of Japanese mayo, it’s necessary — plain and simple. If you’re the type to hiss at the idea of MSG, don’t fret; stick to what you’re comfortable with. Onto the ruby-hued pickled red ginger. It’s a thing of beauty, and this is coming from someone who doesn’t fancy the ethereal pink slices served next to sushi. It must be the plum vinegar. Either way, I was originally going to skip out on it, but I’m so glad I didn’t. It adds an incredible zip to the pancake that I can’t picture it without. Though this dish intimidated me at first, I can say with confidence that it was a breeze to put together and it’s super simple to cook. Due to the girth of each pancake I assumed they’d be difficult to flip without breaking, but everything worked out swimmingly. Of course, the easiest part was devouring the damn thing. Okonomiyaki is a glorious savory Japanese pancake that will blow your mind with it's varying textures and umami flavors. Some folks enjoy the addition of meat to their okonomiyaki. I like to add cooked and roughly chopped shrimp to mine but you can also use squid or any other meats you fancy. Simply add your meats to the top of the pancake when you initially spoon it onto the pan and press down with a spatula to secure. I always cook my fish prior to this step to avoid it from being undercooked. In a small bowl, mix together the honey, oyster sauce, Sriracha and Worcestershire sauce. Set aside. In a large bowl, combine the flour, salt, sugar and baking powder; whisk until well blended. Set aside. Peel the nagaimo and grate it into a small bowl. Die a little, then wash your hands. Add the grated nagaimo and dashi to the bowl of dry ingredients. Whisk until combined, cover and refrigerate for an hour. In the meantime, you can cook any meats you plan to add, prepare your Okonomiyaki Sauce and mince your cabbage, core removed. If your cabbage is very moist, press with a paper towel and set it aside to let the moisture evaporate so that it doesn't dilute the batter. Once the batter has been in the fridge for an hour, remove it and add the eggs, the chopped shrimp chips or tempura scraps and the pickled red ginger. Stir until well-combined. Add the cabbage to the batter approx. 2 cups at a time. Stir well before adding the rest. In a large pan, heat the vegetable oil over moderate heat. Carefully spoon the batter in a circle on the pan (approx. 2 cups worth). If using meat, place is on top and lightly press into the wet batter to secure. Cook covered for 5 minutes. Once the bottom side is nicely browned, carefully flip it over. Gently press down on the okonomiyaki to reshape (if needed) and keep it together. Flip over one last time and cook, uncovered, for 2 minutes. Transfer to a plate or baking sheet and continue with the others until done. Brush the Okonomiyaki Sauce over the top surface of the pancake, then drizzle the Japanese mayo over it in zigzag lines. Sprinkle some katsuobushi over it, followed by your other toppings. In my case, it was Nori Komi Furikake, thinly sliced scallions and thinly sliced pickled red ginger. * There is one hour of idle time for this recipe. * Okonomiyaki freezes well. Once cooled, wrap each in aluminum foil and place in a freezer bag. When you want to eat one, take it out, let it thaw and put it in the oven at 350 degrees until it reaches your preferred temperature. JustOneCookbook.com — It’s safe to say that 90 per cent of what I’ve learned in Japanese cooking has come from Nami and her amazing blog. Nami, if you read this, thank you. I have never heard of this dish before but it looks incredible and I can't wait to make this. Not sure if I'll be able to find any naigaimo here in PEI, but a "veg" pancake topped with deliciousness.. I don't know what to say. We have "Kartoffel Puffer" in Germany which is the closest thing I could relate this to, (grated cooked potato with various seasonings and egg mixed in then fried like a pancake). Not sure why I never thought of cooking other vegetables in pancake form though! Definitely let me know how you like it, Markus! I'd never heard of it either, so I was skeptical about making it myself since I felt I was going in blindly. Luckily everything worked out swimmingly and the end result had me believing that that's what it was meant to be like. Kartoffel Puffer sounds right up my alley, too. I'll have to give that a shot! Your pancake looks so yummy. It must be really flavourful. I am sure going to try it. Thanks for sharing. This looks like a bomb of flavours! I've never heard of Okonomiyaki before, thanks to you it's seriously on my radar... Looks so yummy! I'm glad I've enticed you with this, Marie! It totally is a flavor bomb and it's one of those things that leave you wanting another one, but you know you shouldn't… haha. I'll have to check Korean pancakes out! Thanks, Shareba. I think you'd love these — they are full of umami. Coming back to this post has me craving them all over again. This recipe totally jumped out at me, screaming 'Try Me! ", so I guess I've gotta listen. It sounds absolutely delicious. I love egg-based recipes. I'm going to look for the Chinese yam in our Asian supermarket and hope to find it. I know you said it's optional, but would it work to substitute regular grated yam or sweet potato if I can't find it? I'm intrigued by the texture you've described, so am curious to try it. Can't wait to taste the whole pancake. Haha, I hear you Margaret! When I was doing research for this series, this bad boy jumped out at me too. I listened, and I encourage you to as well. It is so. friggin'. good. I wouldn't substitute the Chinese yam with a regular yam because they have two completely different textures (you'll see what I mean). The Chinese yam almost has the texture of an apple, and when you grate it, it turns into a slimy substance. So if you can't find one, just omit it completely. But your local Asian market should carry them! I hope you can find it just so you can experience the uniqueness of the thing ;) Please let me know how it goes! Great research, with photos and descriptions to match. I'm going to have to attempt this myself, once the holiday eating has played itself out. Thanks, Teresa! I'm glad you found this post useful. Let me know what you think once you give it a go. It's damn delicious, and surprisingly easy! I've actually made Okonomiyaki before and loved it. I used a recipe from a restaurant here i Vancouver ("Dirty Apron") - it was fantastic, but I didn't use red pickled ginger which I am totally now regretful about. This looks fantastic Dana! I hope you enjoyed eating it! Of all East Asia cuisines, Japanese is my favorite and close to my heart. I love Japanese food, and that includes okonomiyaki. But we've never made it ourselves! Thanks to your recipe, now we can attempt making them and eating them in the comfort of our home. Delicious! Pinned in my "Recipes I'm going to try" board :-) ! Thanks, Nicoletta! This comment tickles me. I'm *so* glad you feel inspired to make this at home. Despite the prep/chopping, it's a simple dish to make and the reward is oh-so worth it :) Please do let me know when you give it a shot! Wow! I had never heard of this dish, but it seriously sounds delicious!! !